Dr. Beeston grew up in Provo, Utah. He completed most of his undergraduate studies at Utah Valley University. Following his undergraduate schooling, he attended Creighton University School of Dentistry in Omaha, Nebraska, where he graduated with high honors. 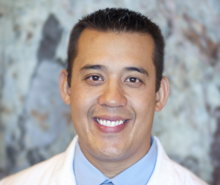 While at Creighton University he received awards for excellence in endodontics and prosthodontics. He has donated time to provide dental work to those in need in Hondurus, correctional facilities, and providing dentures for the homeless. Dr. Beeston completed his implant residency at the prestigious White Cap Institute. Dr. Beeston has been married to his high school sweet heart for over 13 years and has been blessed with two beautiful children. When He is not at work he enjoys camping and four-wheeling with his family, working on computers, playing the guitar and piano, playing racquetball or just hanging out with his family. Dr. Beeston is very friendly, patient, and compassionate and looks forward to providing dental care to you and your entire family. He is very knowledgeable and enjoys all aspects of dentistry. Dr. Beeston practices at our Roy office.